Klare Linien – einzigartige Formen! Wir bei SOLIDAY legen größten Wert auf Design und Qualität der Werkstoffe und halten zweckorientiertes Produktdesign und Innovation für unverzichtbar. Für eine perfekte Sonnensegelverspannung stehen verschiedene SOLIDAY Design-Masten zur Auswahl. Mit der patentierten SOLIDAY Höhenverstellung lässt sich die Neigung des Sonnensegels in einem Bereich von 1,5 m individuell an den Stand der Sonne anpassen. Mit Hilfe des Snap-Systemes wird ein einfaches und schnelles aufspannen bzw. einrollen des Sonnensegels ermöglicht – perfekt geeignet für eine feste Sonnensegelverspannung. Durch die integrierte Fallstoppklemme kann das Segel bei plötzlich auftretenden Windböen sehr schnell gelöst und eingerollt werden. Mit Hilfe der patentierten SOLIDAY-Welle lässt sich das Sonnensegel einfach und schnell mit nur einem Seil per Hand aufspannen. Die neue, selbst aufrollbare Welle sorgt dafür, dass das Sonnensegel automatisch wieder eingerollt wird. 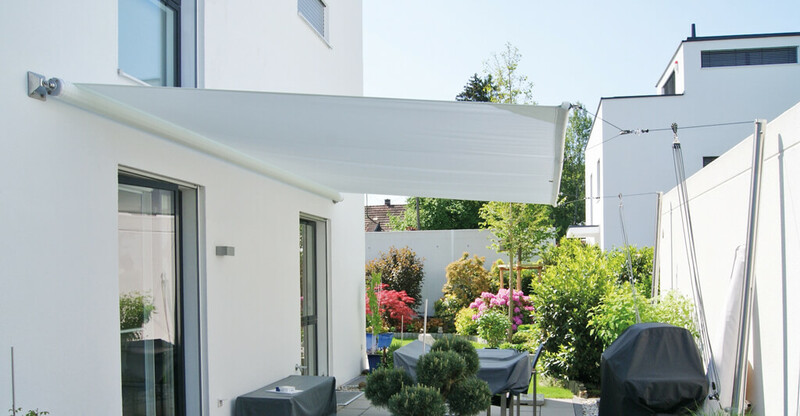 The SOLIDAYY-XS combines two advantages in a simple way: on the one hand the flexibility of the sun sail and on the other hand the practical arrangement of the drive shaft along the wall. 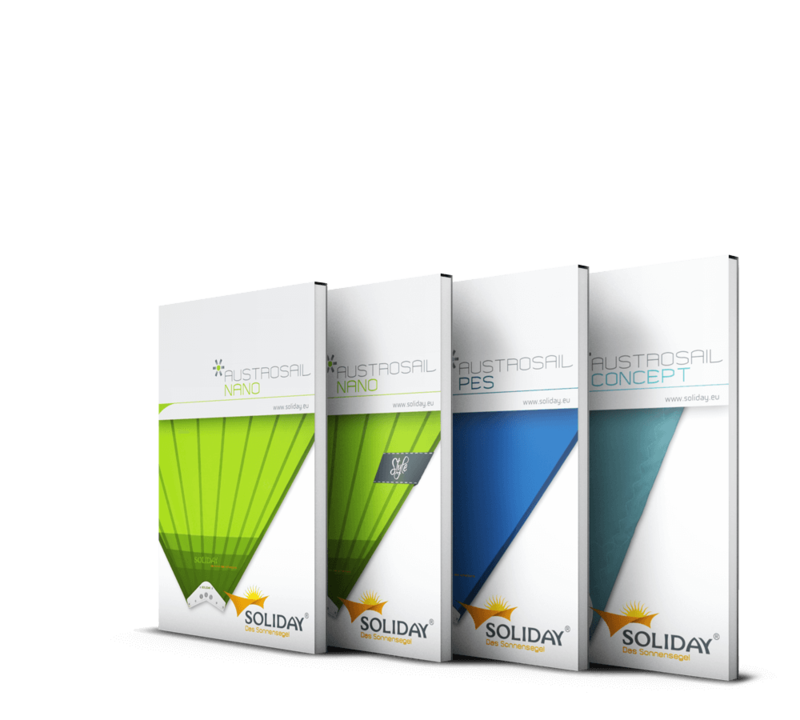 Soliday-XS establishes completely new worlds and application areas with two new patents. 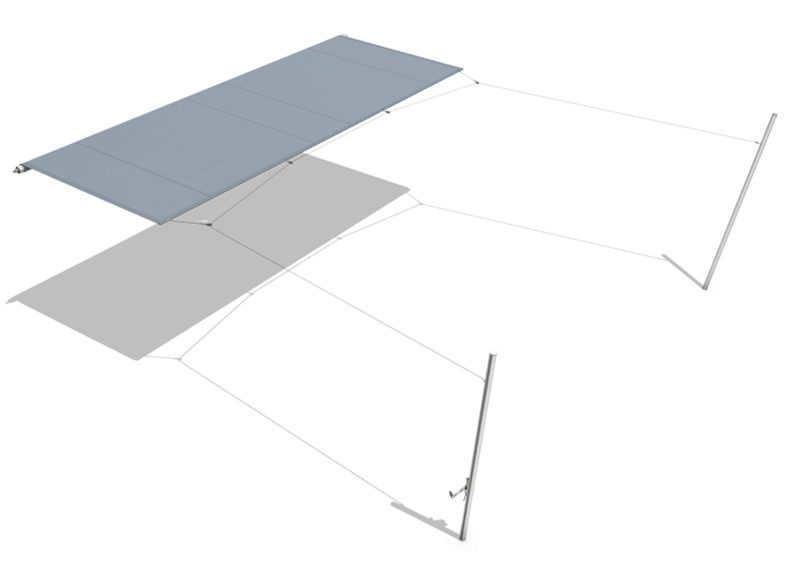 Equipped with the new 1-point handling of the X series, a self-winding drive shaft, the sun sail can be manually extended away from the wall over a distance of 6 m and an area of up to 36 m2. 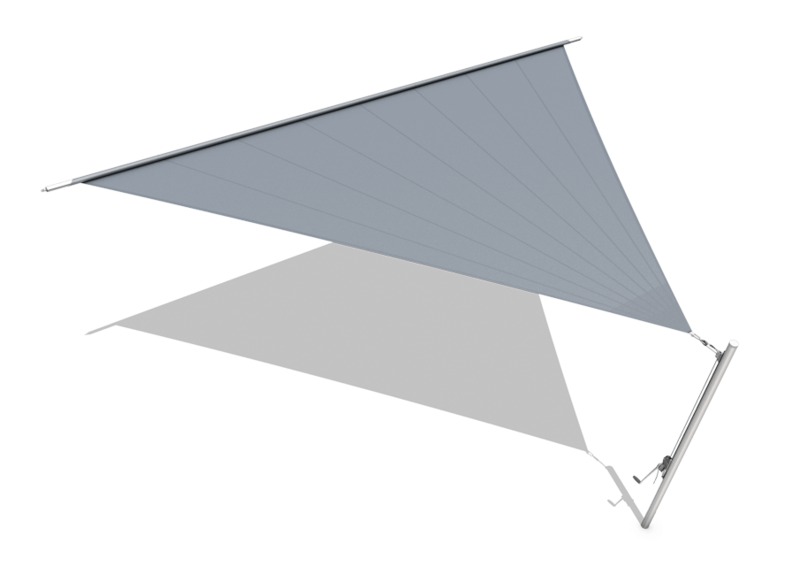 With the 2nd patent - a new bracing technique - the masts standing in front of the sail or attachment points can be placed outside the corner of the sail, thus ensuring a clear, unobstructed view to the front. The height adjustment is mounted on a slide rail made of aluminum and can be individually adjusted in the range of 1.5 m. Especially important when the sun is low in the late afternoon. 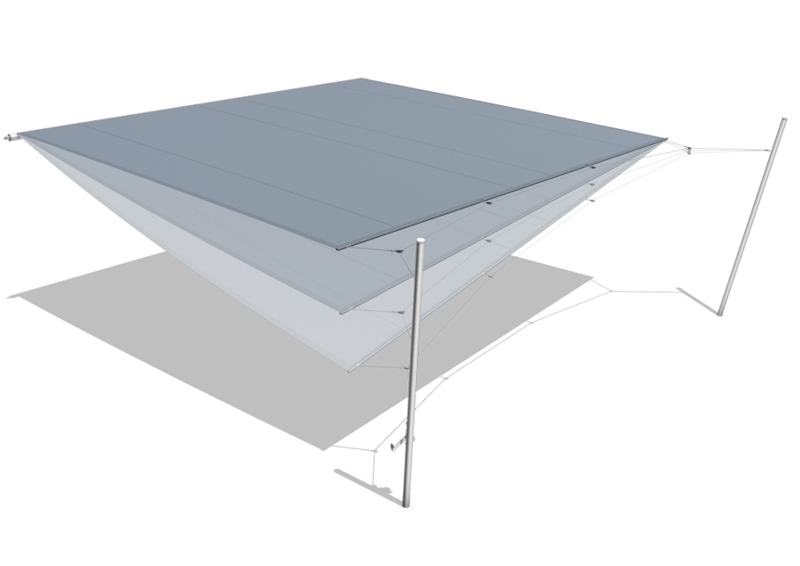 By combining a waterproof SOLIDAY sun sail fabric and a sail angle of at least 15 °, SOLIDAY-XS systems are also ideal as rain covers! Bad weather is therefore not an issue for sun sailors! 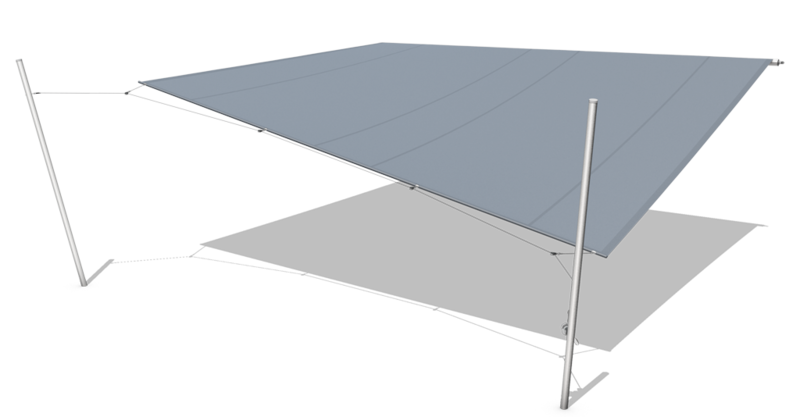 SOLIDAY's sophisticated snap system provides a simple concept for tensioning and quick disassembly of sun sails, ensuring easy and comfortable handling of the SOLIDAY-XS semi-automatic retractable sun sail system. The snap-system, incl. 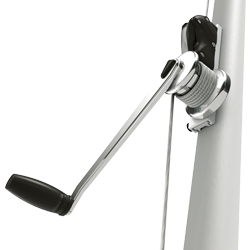 fall stop clamp, snap-win BASIC, 20 cm crank and adapter plate, is already included in the basic equipment. 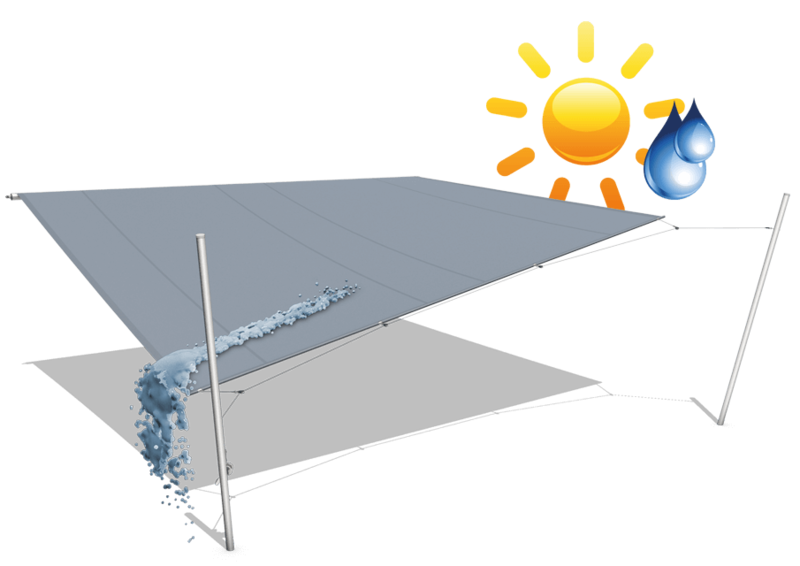 With the fabrics AUSTROSAIL PES, AUSTROSAIL NANO, AUSTROSAIL NANO-STYLE and AUSTROSAIL CONCEPT, SOLIDAY offers the right sun sail cloth for every purpose and every requirement - in a great variety of colors, made for wind and weather. 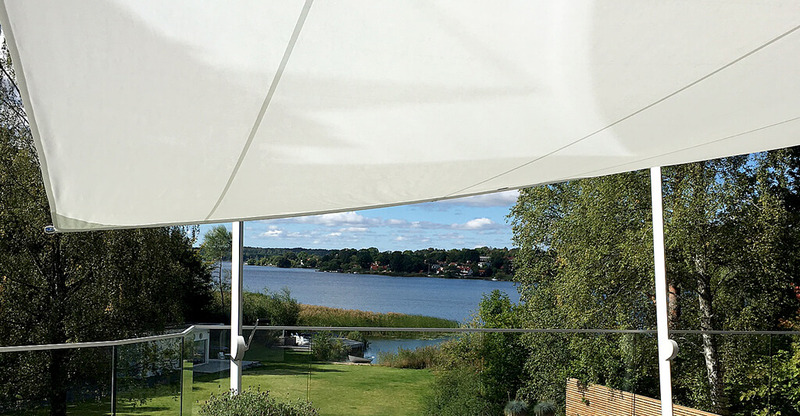 The fabrics are made of easy-care and durable quality, which not only perfectly protect against harmful UV rays, but are also glare and privacy protections. 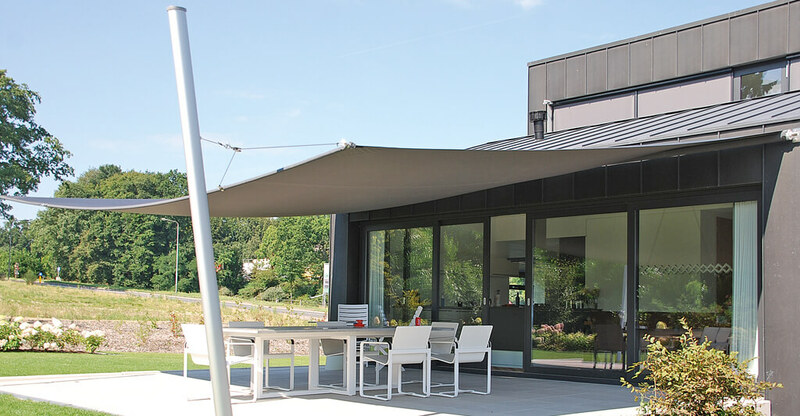 The droppole is a specially designed sunsail pylon made of aluminium, conceived to meet the highest of demands. 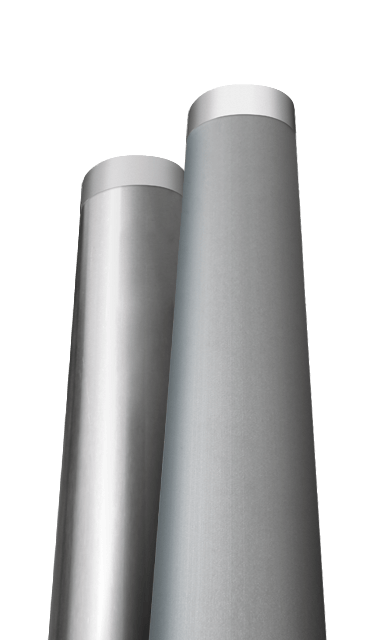 The special drop-like shape gives the pylon 4 times greater rigidity in the direction of the applied force and can be positioned either straight or at a standard 10° angle. All cables and electrical wiring for possible accessories are hidden within the pylon itself, resulting in a clean, understated look that is quite unique. 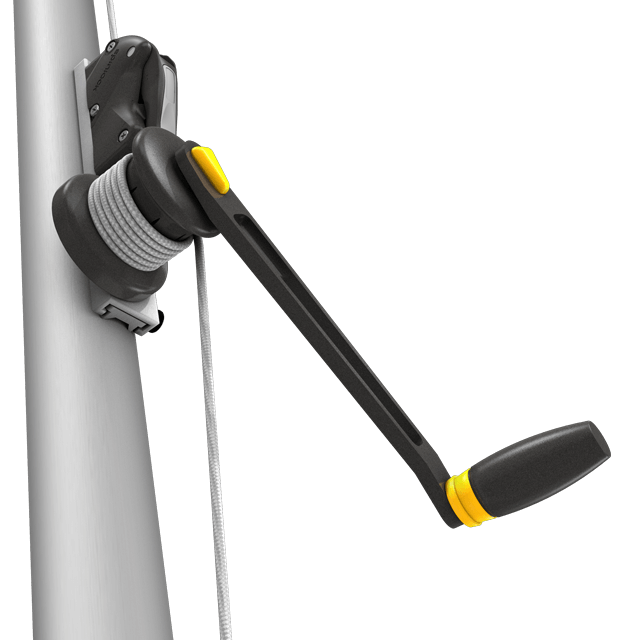 The SOLIDAY mast appeals through uncomplicated, elegant design, distinguished by robust durability and high material strength. 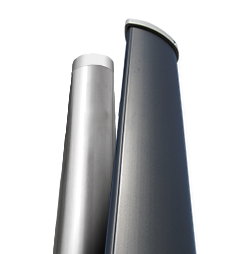 Similar to masts used by windsurfers, the SOLIDAY mast will automatically return to its straight original state, even when subject to high stresses. 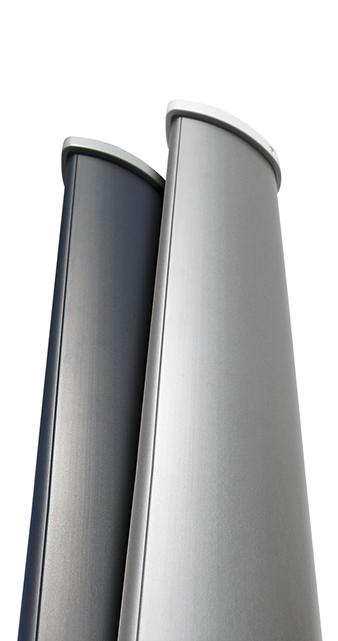 Customers can choose between pylons made either of stainless steel or highly sturdy anodized aluminium. In the linear cutting form, the sails are sewn according to the widths of the fabric to the size of the sail by means of felled seams. A special feature of the Soliday XS is the minimal sail rejuvenation. 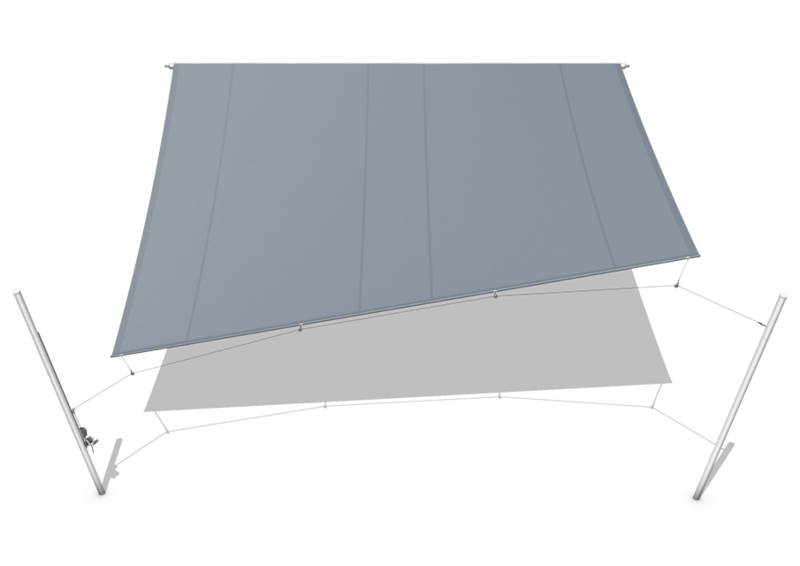 This results in a nearly rectangular sun sail, which ultimately means more shade to enjoy. In the beam-cutting form, the fabric webs are fan-shaped and assembled with a water-tight ultrasonic weld. The side edges are straight and are additionally reinforced with webbing. 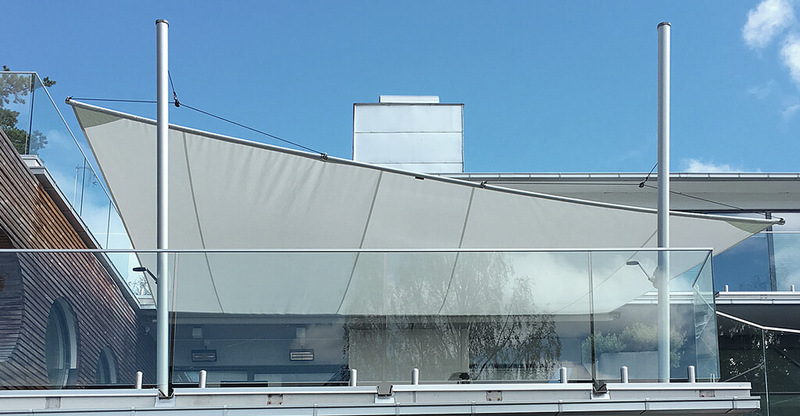 The sail corners are additionally reinforced and provided with a decorative seam. With this type of confection, Soliday consciously incorporated the sporty flair of yachting - like a day at the ocean.